A still but grey start to Thursday morning as we move into Day 2 of Henley Royal Regatta. 88 races today and a lot of local crews this afternoon. Come back throughout the day for up to date race reports and reaction from all our local crews. You might read something missed elsewhere! It's our last race of the day, and it's a tight one. After two easily verdicts spectators were given one last hurrah with Kingston giving it their all to ensure NSR Oslo didn't make it into the next round. In the end the Norwegians were just able to pull ahead, crossing the line half a length before their opponents. That's the last race for tonight, so we will bid you farewell until 8.30am tomorrow morning, when all this will start again - hopefully with some better weather! An assured performance from Becket's B crew, which begs the question, if this is the B crew, how good is the A crew? Becket started well and pulled ahead in composed and measured manner, until they had more than a two length lead. They had a steering issue around the mid point of the course, but kept up a relentless pace as they corrected the error. Becket B will now meet Henley in the next round. A change of pace now as pairs take to the water. Vesta Rowing Club's Woodfine and Bond beat Cheale and Day with an Easily verdict, booking their place in the next round. It's our last local crew of the day taking to the water, and they put in an assured performance. Henley came out to a really strong start which set them on a good strong course. St Paul's struggled with their steering, getting close to the booms at several points and having to correct, which slowed them down. Henley sculled the course smoothly and with great rhythm, extending their lead seamlessly as they rowed their home water. Henley won this event in 2012. On this performance they have to be considered contenders for 2017 too. Henley won by two and a half lengths. An exciting and tight race between the two junior quad crews as we get towards the end of the day. Globe pulled ahead early but Lea stayed with overlap right the way through to the enclosures, ensuring spectators not tempted to leave early were given a thrilling spectacle. Globe took the win by one and a quarter lengths. Regular visitors Sydney, who have competed in various configurations in 19 of the last 20 Henley regattas, started with an assured row as their first in the competition. The coxed four weren't given everything their own way, with Southampton sticking close to the Australian crew throughout. The Aussies rowed steadily and with confidence though, finishing one and three quarter lengths ahead of their opponents. It's a happy and relieved Sydney crew moving through to the second round - last year they were disqualified by the umpire in the first. London knew they had a big task to beat NSR Oslo, but despite doing all they could to keep up with the Norwegians they just weren't strong enough. NSR Oslo are one of the favourites for the cup, and on this performance it's easy to see why. They finished two and a half lengths clear of their opponents. An exciting derby saw Godolphin and Latymer win by a verdict of two thirds of a length. Henley Standard reporter David White was able to get reaction from Shiplake College headmaster Gregg Davies after his crew's victory in the Princess Elizabeth Challenge Cup. He told us: "I just think these guys as a team, they're special. "Going into the race we were favourites but the Abingdon coach is leaving so we all knew they were going to throw everything into it which they did. They were probably up on us at the start. But I think what we had this year which we hadn't had in the past was people moving through the school so they didn't panic. Jamie Pond is a three-year cox, he controls the crew and he spots what needs to be done so once we got that length we controlled the race. I felt that was a professional job." Shiplake will meet American crew Gonzaga High School in the next round, who put in a thrilling performance in the 6pm heat. Talking about the next round Mr Davies added: "I'm much more composed today than I was yesterday. We're taking it one race at a time. We respect all the crews here. What we absolutely want tomorrow is a really quick start, to get a canvas or a third of a length up and if we can get that I really think we can beat them." Taurus had a 40lb weight advantage against the lightweight Leeds crew which saw them take an early lead. Newcastle stayed close though and kept their stroke rate up, presumably hoping that given time Taurus would tire, giving them an opening to make a move and gain some ground. But the experienced Taurus crew has won at Henley before and looked comfortable as they worked their way along the course. Despite Newcastle clocking 38 strokes a minute to the end Taurus took the win, by one and a half lengths. Both teams started strongly, although Leeds had a slight steering wobble that needed correcting by Temple Island. Thames pulled away quickly and consolidated their lead with assured rowing that Leeds just couldn't make up. Thames won this event in 2015, and on this performance should be clear to move through a few more rounds. Thames won by two and a quarter lengths. Tideway Scullers' had an early steering error which saw them warned by the umpire. The Claires Court quad took advantage to take a considerable lead, sculling comfortably along the course largely unworried by their opponents. Claires Court School won last year, but only one member of the crew returns this year. The crew's performance today has to see them as contenders for the final. They were awarded an Easily verdict. An exciting heat with one of our hotly tipped local junior crews. Shiplake and Abingdon have met before this year, with Shiplake generally coming off best. However, with Abingdon having won this cup three times before, they can't be discounted. Shiplake took a length's lead early on, and by the mile marker had stretched it to a full two lengths. The won comfortably, crossing the line two and a quarter lengths ahead of their opponents. Shiplake will now meet Gonzaga tomorrow. An easily verdict for the German pair, Rommelmann and Steinhubel, who row in the under 23s. But Wallingford's Peter King, 47 and Daniel Harvey, 30, bought experience to the course, with King in particular a regatta veteran - prior to today he last rowed here in 2001 and first took to the water here in 1991, which is pretty good going. He also drew glances for a little wing mirror attached to his cap so he could get a rear view of the booms from the bow seat. Ultimately unsuccessful today, he will return for the Henley Masters Regatta in a few weeks. A composed start by Ely saw them open a strong lead, with them notching up a pace of 31 strokes a minute, giving them around a four length lead over by Fawley. By the stewards enclosure an increasingly confident Ely had slowed to 29 strokes a minute, but while Lady Eleanor Holles were still up at 36 fighting to the last they were just not able to pull it back. The Henley Standard's Jamie Presland was able to talk to George Rossiter, stroke for the successful Leander crew in the Visitors' Challenge Cup as he came off the water. He said: "It was a good race, we didn't know what to expect from the other crew. We went in expecting a really hard race. We had a good start and kept pushing but we were able to conserve energy at the end. The early races are important to set the tone for the week and give you confidence with the harder races to come. We're feeling good and taking one race at a time." A clean start meant that by the time they were approaching Fawley Durham had around three quarters of a length over their opponents, rating 38 strokes a minute to Boston's 37. By the finish they had extended their lead to one and three quarter lengths, and will meet Imperial College in the next round. A commanding performance by California saw them pull ahead of the Leander / Thames crew, despite the two having very similar stroke rates through the early part of the race. The British crew stayed close, but were unable to pull it back, with California winning by one and a half lengths. A tension-filled long wait before the start, before the two crews burst from their stations. Winchester got an early warning from the umpire for their steering, but moved back towards the Bucks station while working hard to establish an early lead against the Americans. Winchester got two more warnings for straying too close to the centre of the course, with Gonzaga being caught by their wash. As Winchester corrected their steering Gonzaga seemed to capitalise, making up the gap so the two crews were virtually level at the half way point. By the enclosures the composed Gonzaga crew had pulled ahead and were around a length clear. As they finish the race they looked more confident and their strokework looked neat and clean as they passed the line. A hardworking Winchester crew just couldn't make up the lost ground. Another exciting race for the evening spectators. Imperial started strong, dominating the crew with a neat and powerful sculling style. But Laga stayed closed, with a strong challenge that meant Imperial had to fight to the last. Imperial finished one length ahead. Leander started well, maintaining boat speed even in the face of an early steering correction. The local crew soon had clear water between them and the Oxford composite crew, clearly comfortable on their home stretch of river. Leander crossed the line two lengths ahead. A smooth start and an early advantage for St Paul's, who had soon moved too far away for Pangbourne to catch. St Paul's were comfortable winners, and seemed to finish the course focusing on their technique, using it as a training row as they came up to the line. St Paul's finished three and a quarter lengths ahead of their opponents. Agecroft took the lead early but Lea stayed close along the course. It wasn't quite the photo finish of the previous race, but Agecroft finished three quarters of a length ahead of their rivals, booking their place in the next round. Now we head back to the student coxed fours. We're back from tea and straight into race 66 of 87 scheduled for the evening session. We start with junior quadruple sculls, in the Fawley. A thrilling start to the evening, with two great crews going head to head. Tideway Scullers' took an early advantage, but didn't take anything for granted, knowing that Clonmel won yesterday's heat from a length behind at one point. Scullers' crew had age, weight and experience on their opponents but Clonmel matched them stroke for stroke by the time the two crews reached the enclosures. The crowd cheered them on, and it was a photo finish as the crews crossed the line. After some deliberation, the final verdict was a Tideway Scullers win by just four feet. Brilliant stuff. A rearranged race from earlier this afternoon, saw seeded San Diego take to the water for the first time. Latymer started well, ensuring that they were bringing it to the more hotly-tipped crew. But then in one of the upsets of the day, suddenly they pushed ahread, leaving a scrappy and confused looking San Diego in their wake. The Americans kept pulling hard, but by the finish line there was nothing they could do, with Latymer a full four and three quarter lengths ahead of the favourites. That's it now until 5.30pm so we're off for a cup of tea. Join us for an evening session with lots of local crews taking to the water. Both teams started well, with Maidenhead making an early move to edge ahead, but Westminster ensuring they kept contact with their opponents. By the mile mark Maidenhead, the seeded crew, had established a firm lead, but both crews were looking strong as they continued powering along the course. Maidenhead won by two and three quarter lengths. Back to coxed fours now, with Durham steering themselves out wide clear of the boom early, before straightening up and slipping away from the American crew into the lead. Maximising on their good start, Durham set a smooth rhythm, lengthening out their strokes and increasing their lead on their opponents until they were at least a length ahead. But the powerful Colgate crew pushed forward in the final quarter of the race, sailing past an under pressure Durham whose cox Ben Rich did everything he could to spur his crew on. Neither crew gave up before the final stroke, and Durham finished first in a thrilling ending to a great race. Durham finished three quarters of a length ahead. Shrewsbury gave it their all, but despite a cohesive performance they just weren't able to keep up with an assured performance of the Eton crew who seemed to have more power, stamina and technique on the day. Eton finished two and a half lengths ahead. Two American crews squared up in the quads in a speedy heat of the Visitors' cup. The powerful Boston crew boasted considerable international experience and were able to put this to good use by the half way point where they pulled ahead by several lengths, leaving Cornell looking laboured in their wake. A comfortable win for Boston who finished four and a quarter lengths ahead. Radley put on a bravura sculling performance, pulling ahead of St Edwards early and extending their lead with every stroke until there just wasn't enough course for them to pull it back. Radley finished two thirds of a length ahead. Local Leander development crew Star and Arrow A had a tough time against the seeded Windsor Boys crew. In their first appearance on the water this regatta, Windsor got an early lead of half a length by the time they passed Temple Island, and were only able to consolidate this further through the latter parts of the race. They finished one and three quarter lengths ahead of Star and Arrow. Back to the juniors now for the Princess Elizabeth Challenge Cup. The Australian crew were one of the fastest on the water in their heat yesterday, and took the lead early on here today too. Hampton dug deep and kept fighting, but just weren't able to keep up with the strong, coherent crew who finished with a very safe margin of two and a quarter lengths. A strong start from both crews, but by the half way point the Thames crew was inching ahead. Kingston stuck close, around half a length behind, but a final push was too little too late for Kingston who pushed to the last but just looked more tired than their opponents by the finish line. Thames finished just a third of a length ahead of their opponents in a nail biting finish. Steering issues on both sides saw the two coxless crews nearly clash in the early part of the race, with the umpire issuing warnings to both. Monaco Aviron was able to pull ahead once they were past Temple Island, although by the enclosures both crews had moved more central and the CN France crew was sculling in the wash of their opponents. The victorious Monaco / Grenoblois composite now face the Cambridge crew in the next round. A strong, straight and purposeful start from Newcastle, while Deerfield initially looked a little more laboured. Both crews started flat out and speedy, vying to establish dominance against their opponents and unwilling to give ground. By Fawley Newcastle was starting to edge away from the American crew, both in terms of fitness and technique with neat puddles showing their rhythmic and controlled strokework. Newcastle finished two and a quarter lengths ahead. Malvern are a seeded crew and came straight into the Fawley in this round, but perhaps Gloucester's run down the course yesterday stood them in good stead. The British crew may have been considered outsiders, but their performance was well-paced and saw them take a good lead on the Americans by the mid way point of the race. They finished a full three lengths ahead of their opponents and progress through to the next round. Steering errors from both crews in the first few hundred metres of the race were quickly corrected so that Commercial could pull ahead into a clear water lead by the half way point. Commercial had secured a convincing lead of more than four lengths by the enclosures though, so no immediate danger from the error. But this is the second race in the Wyfold where the Irish crew has had steering issues at the start, and this is something they're going to want to get a handle on lest it hamper them as they move into tomorrow. Back to the Princess Elizabeth for an American derby which saw two assured crews putting in solid performances that ended with an exciting, close finish. After their race yesterday Deerfield's coach said they were pleased with the start and end of the race but needed to work on the middle section. In today's heat Kent took an early lead, but Deerfield wasn't ready to hand the win over. They put Kent under pressure through the middle part of the race, closing the gap and digging deep to pull through from behind and win across the line. They finished one length ahead of Kent School. Cantabrigian were quoted yesterday saying they were thrilled to have made it into day two. Tideway Scullers' may have been favourites coming into this heat, but Cantabrigian most definitely made them work for it in an exciting race that was well-received by the crowds on the banks. By the time they reached the enclosures Tideway Scullers' were clinging on to a lead of perhaps half a length, but Cantabridgian, sticking close to their boom, kept the pressure up right the way through to the last strokes of the race. Scullers' finished just half a length ahead, and Cantabrigian should be proud of a great performance. Onto the coxless fours now, with the light blue-clad Cambridge crew receiving an early warning from the umpire to get back towards their station. The British crew adjusted their course without slowing their rhythm, and soon had clear water between them and their opponents. The unhurried crew finished a full three and a quarter lengths ahead of the Germans, whose pedigree was not reflected in the result. Both crews started well, but initial steering from the bow seat saw Thames get a warning from umpire Matthew Pinsent for getting too close to the middle of the race way. Maidenhead took advantage of the steering adjustment to take an early lead, but the crews overlapped as they continued through the first third of the course before the seeded Thames crew pushed back to take the lead. Thames crossed the line two and a quarter lengths ahead and will progress through into Friday. This race has been pushed back to the last race before tea. The New York crew boasts US national team rowers and their assurance and skill showed through the race. 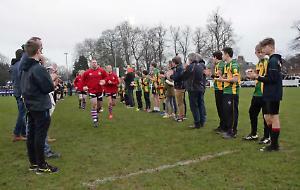 They took an early lead against Durham, and were able to consolidate it with a powerful, fluid performance which saw them finish two and a quarter lengths ahead of their opponents. Another local-ish derby with the Reading University team drawn against a Leander quad which last year won the Queen Mother Challenge Cup. As expected, fluid sculling saw Leander push clear very quickly, leaving them untroubled by Reading for most of the race. They finished three and a half lengths ahead and, presumably, with plenty left in the tank for the later stages of the competition. Rowan Law, two seat in the Leander crew, is from Queen Street, Henley. He told reporter Jamie Presland: "It was a good start to the regatta, we set out with a plan and stuck to it. It gives us lots of confidence and we are looking forward to progressing. "We are focused on doing the best performance we can and if that means winning then so be it. It's about making improvements each day, having a clean row and doing everything right." A massive win for the Washington school who beat Montclair by three quarters of a length in a race which saw both crews neck and neck throughout. Henley Standard reporter David White grabbed a word with Star and Arrow crew member Jo Willis as he came off the water from the local derby heat in the Fawley. Jo said: "We knew that race would be tough and we weren't expected to win it. They showed us they are worthy of their place as the top quad. We were very quick off the start to stay with them until 500. Overall it was a good race. When we first got the boat we didn't think we were going to qualify, so to get this far is really good." Talking about the difficulty of racing a crew effectively from the same club (Star and Arrow are Leander's development crew) he added: "There's a lot of respect between us. We weren't really talking before the race. We knew what we needed to do and they knew what they needed to do. They did well and have been good all year." Meanwhile, reporter Jamie Presland caught up with Matthew Peters, number three in the Leander boat. He told us: "It was a really good race. They were with us off the start and they put up a really good fight. It makes it harder to race against club mates. We knew what they were capable of but they knew our race plan and it's always hard knocking mates out." A superb race for Royal Chester and a surprise as they beat the seeded German team. Chester started fast and did all they could to extend an early lead, in readiness for the German crew to push back in the final third of the race. But despite the Germans turning on the power, it was just not enough to catch the British crew. The crowds cheered on the close finish, with the boats overlapping at the end. But despite Allemannia von 1866's best efforts, Chester crossed the line three quarters of a length ahead, with the clearly delighted crew booking their place into the next round. A tale of two sets of steering here with Eton and Burway slowing themselves down off the line with some heavy-footed steering in the early stretch of the race, which Reading took advantage of. Once Reading found their rhythm they kept a straight line down the course, solid in-sync sculling saw them increase their lead until the Eton and Burway crew had no hope of catching them. Reading finished three and a half lengths ahead. The University of California crew made a fast start, pulling away quickly and leaving the Irish crew in the wash.
By the time they reached the enclosures the Cal crew was basically paddling, clearly looking to conserve energy ready for the next stage of the competition. A comfortable win for Berkeley, who finished two and a half lengths ahead of their opponents. Leander's development quad is now head to head with their top quad colleagues in a heat that showcases some of the best junior rowing talent Henley has to offer. As you would expect, the Leander crew took the lead early and there was soon clear water between the two crews. But the Star and Arrow crew, which includes rowers as young as 15, acquitted themselves admirably, gaining experience on the water in regatta conditions. Leander haven't won the Fawley cup as a quad yet, although members have been successful as part of a composite crew. This quad is seeded in the competition and they clearly wanted to ensure they had a safe, straightforward row today to get into the next round. The boat flowed through the water with no mistakes or controversy, and they managed just that, finishing four and a half lengths ahead. We're back from lunch with a great heat in the Visitors' cup. Mercyhurst started really strongly, but the hotly tipped Edinburgh crew outpaced them, finishing two lengths ahead. Last race of the morning and it’s lightweights against the heavy Oxford Brookes crew who are fancied in this event. At the start of the booms Nereus are ahead but Brookes react and push away at the 500m mark. The early pace is paid for and Brookes power away. Brookes are making their mark on this race and maintain a couple of lengths clear water at a lower rate to the Nereus crew, who are quick but don’t have the same power profile. Brookes are having a comfortable paddle, as Nereus keep to their race plan and take it up into the public enclosures. Nerues keep coming back in front of Stewards but Brookes aren’t fazed – there’s not enough course left. Oxford Brookes beat Nereus, Holland. The second most important eights race at Henley and an Oxford old boys crew racing the US. High level crews but not international crews both teams are level into the booms as Brown make a move to push away from the Oxford boys. Not moving away quickly it’s half a length at the 500m mark. Brown stretch out a lead at Fawley, as Team Keane, though still racing are not in touch. Brown are making it look easy. Coming into the Steward’s Enclosure Brown are maintaining a steady rate to power through to the finish whilst Team Keene, in traditional caps rather than baseball caps, take it up. Men’s quads and the Norwegians wobble down the middle of the course off the start but they get into their rhythm and move away to a length lead over the bath crew. It looks like they will increase the margin at the 500m mark as they start to turn this race into a procession. The Norwegians look Dynamic and bath can’t answer. The Norwegian crew has a former army sergeant sitting in the bow and despite being the lighter crew they are using their drilled technique to make their mark on this race, as they scull comfortably through past Stewards. A real squeeze off the start and a little check from Scullers and Cambridge 99 are straight into the buoys , only just getting away from the start of the booms. Scullers were warned as well with half alenght but aren’t moving away in the first 2 minutes. As they settle into their rhythm at the 500m they start to move away. Scullers stretch their lead away from Cambridge 99 who were rating 38 at the start of the course. Both crews are tandem rigged in the middle of the boat. The scullers crew are continuing to pull away using their finish Cambridge 99 take it up at the public enclosures but they aren’t in touch with the Scullers crew. Tom Gale coaches the Tideway boys and will be pleased with this comfortable win 99‘s are sticking to it but Sculler’s are more efficient and take the win. Westminster school old boys, racing as Fulham Reach versus a composite boat from Newcastle, who wait attached to the start, whilst a jet does the course. A little pull round from Newcastle& Durham crew and some meandering, being warned by the umpire. They move back as the Westminster boys take an early lead. They get back on to their rhythm and don’t let the other crew walk away. The Newcastle crew are lightweights are racing slightly higher than the Westminster crew. They are aiming to make inroads on the slight advantage the Westminster crew. The conditions have become an issue as the launch wash starts to affect the reach. Newcastle take it up in front of Fawley and move away from the Westminster crew and then open clear water. They are warned again by the umpire to keep their course. Westminster look like they’re a little outpaced as the other crew motors away and relaxes into their rhythm. Newcastle are making it uncomplicated and keep it chopping away to move to an easy lead. Westminster are keeping the power on but they have too much to make up despite good quality sculling. Italy vs Shiplake and Torquay. This is an interesting match. The Italians are moving across but gain a lead over the local crew. They are struggling to keep in touch. The Italian double has an amazing pedigree having raced internationally and are racing in Italian colour blades. The bow man in the Italian crew has been at the Rio Olympic games and four times world champion. They are showing their class but are still committing quite hard to this race. They are the current international Italian double. They will be at the world cup at Lucerne next week racing for Italy. This will be a good warm up and they are really taking it to the line. Hugh Mackworth- Praed and Elliot Barton take the polite applause. A very convincing win for the Italians. A little less pressure with a cox and generally a better line off the start than some other races . Thames drop Wallingford with clear water after a minute or so. The Thames crew seem to be less upset by the water and the booms. Thames graft out a lead of a couple of lengths in front of the Barn Bar. The Thames boat is tandem rigged with two stroke siders following each other whilst Wallingford has a more traditional rig. Wallingford are working very hard but aren’t making a dent in the Thames crew. Thames take the rate down to a steady state paddle as they come into the stewards enclosure as Wallingord continue to fight but not make any headway. A good performance from Thames who let Wallingford challenge but aren’t fussed. Thames RC beat Wallingford RC. A very even start but Newcastle are dropped by Edinburgh as they come into the booms. The Edinburgh crew stretch out their lead through the Barn Bar. The Edinburgh crew make it look very easy as they have comfortable quiet scull up the course with the Newcastle crew chasing. Edinburgh don’t take the rate up as Newcastle go through their finish plan making up some of the distance. Two very big eights. York city didn’t have the cleanest of starts . This is a difference between ages as the York crew has an average age of 40. The York crew had to qualify and won a race yesterday but they are up against a crew half their age. Leander move away at the 500m mark as they settl e down. In front of the Barn Bar there’s clear water in front of the Barn Bar. Leander is potentially a favourite for this event. The Leander is a classy boat and they have an efficient stroke whereas the York crew are scrapping along a little having had to recover from yesterday. York still pushing but they won’t have to take another day off of work to cover the next race. Leander take their rate down and have a little wobble in front of the public enclosures as York continue to push, but bodies are hanging out of the York boat showing the pain they are going through to stay insight of the other crew. Polite applause from the Stewards as Leander coast over the finish line. York cross the line with a well deserved second race under their belt. James Fox who sat at six, said: “We’ve had a good couple of days with a nice little run into the regatta. Two American eights and Santa Clara being immediately called up by the Umpire despite these being coxed eights. These are two well matched eights though they take a lead through the Barn Bar enclosures. This is panning out the way yesterdays times show. Let’s see how this unfolds. The length advantage that Santa Clara had developed has now been reduced to half a length at the three quarter mile post. There are big pushes from both crews with the coxes really asking for the rate to be supported at Upper Thames. The margins remain at half a length to Santa Clara. As they come up to the Public Enclosures the crews are digging deep. With Santa Clara hanging on to the half length. Virginia are really building for the finish and focusing in. Virginia have not given up. Do they have another gear? A couple of hundred meters and Santa Clara’s lead is being chipped away by Virginnia. This moves to a quarter of a length. Both crews are racing for the line and Santa Clara win by a quarter of a length. O’Leary gets back in the boat and Sarah Winckless starts the race. This could unnerve both crews. How can he deal with it? They have a clean start and John Graves from the USA starts to put in some distance straight out of the bupys into the track. Graves has a good lead of a length by the 500 m mark, racing in US colours on the blades. He establishes a comfortable lead with a powerful scull up the course. O’Leary seems to have taken his top off having been swimming. Disappointing given he’s a boat race blue. Graves has a strong pedigree, having raced with his brothers and his father. Matt O’Leary is still powering on and sculling well but the advantage has been just a little too much, and not helped with the weight difference given he is a lightweight. Graves has the edge in the power and is not letting O’Leary come back, leavering the sculls through the water. Graves has this in the bag with a powerful display. Coxed fours and a race with a selected crew in the NYAC team. At the start of the booms the crews are level rowing stroke for stroke. At Fawley NYAC have a slight advantage over Agecroft who are hanging in not letting any distance open up. Both seem to have comfortable rate but we could see this change as they hit Upper Thames, a big marker in race plans. Agecroft look like they’re tiring and NYAC are building on that to move to a clear water lead. NYAC produce a surge and move up again to take command of the race. Agecroft will have to do something big to stay in touch. At the public enclosures some Agecroft calls are heard, but NYAC put in a push and take the rate up two pips as they start their build for the line. Agecroft struggle to respond having thrown everything into the start, shortening up. NYAC widen the gap in front of Stewards to take the finish line. Very frantic start from both crews, with both crews level at the end of the Island. The Dutch put in a big push and at the 500m mark take an early lead and sit on that lead. Can Newcastle react? Groningen push again into Remenham Chruch they surge again and then at Remenham Club they maintain a steady couple of lengths of clear water. A loose relaxed rhythm from the Dutch with a fluid and technically strong crew. The Newcastle crew are a little more frantic in the crew. The Dutch crew beat Cornell yesterday so look to be having a good campaign to recapture the Temple Cup for Holland. The Dutch cruise over the line as Newcastle finish second. Quality men’s quads off to a blistering pace on the start. A little bit of a steering diversion from Leander as Molesey establish an early lead. Leander are clawing it back but are losing touch at the 500m with Molesey having a clear water lead. Molesey are using this as a practice run for later in the week as the race becomes a procession in front of Remenham. The big advantage means they can relax and work through their marker points, taking in the noise of Stewards. 11:00 Diamond Jubilee – Marlow R.C. vs Gloucester R.C. Junior women’s quads and a nervous moment at the start as these young ladies wait for the umpire. Gloucester have a strong pedigree in this race and should have a good race. A long pause between the attention and the go. Both quads away cleanly. Gloucester heading out to the middle of the course and they’re quite close together at the start and should be warning them to separate. Gloucester have got out early over Marlow. Certainly the weight advantage of Gloucester is making a difference at the start. Gloucester move to a length lead at the 500m mark, both crews establishing a rhythm. Marlow keep pushing in front of the Barn Bar but through to Upper Thames Gloucester open up the clear water lead. They are dominating the race despite being asked to get back on their side of the course. This keeps the race fair. Gloucester reduce their rate in front of Remenham though Marlow keep pushing through their race plan. Gloucester have a comprehensive lead into the public enclosures and despite the calls from the crowds the Marlow crew can’t make a dent in the lead. Big difference in weights between the Scullers and the heavier has the stronger start. Two contrasting styles and techniques. Moving towards Remenham the heavier man has increased his lead. Using longer leavers he can power it through to maintain the lead and continue to push to the finish. Johnathan Stimpson has put in a good performance over Nial Kenny who knows it’s out of his reach. But he’ll fight anyway. This local club and real problems as the local crew moves across pushed by Headington and the umpire is using his flag vigorously. Coming into the barn Bar stretch they crews are side by side and Henley settle into a good rhythm as they aim to pull away inch by inch. This is a strong race as Headington keep it close to the booms and Henley pressuring Headington. This is a real one on one quad race as the crews are lifting and driving. The wind is playing a par t in this race as the cross wind has lifted. As they approach the enclosures and the voices rise the very well match crews are really racing for the lead. The noise will lift the spirits but both crews need to keep the power on. This continues to be a tight race in front of the grandstands and Henley take the rate up as they move to half a length lead in the last few strokes Headington head for the booms and Henley Take the race over Headington. Powerful eights fire off the start and classically the Japanese go off at a very hard rate. Mitsubishi had a great yesterday. These should be quite well matched eights as both have 6:20/6:22 race times. A good row from the Japanese who pull out to half a length over the Germans. Bayer can see their opponents and could stay in touch through to the finish line, as they push on a surge in front of Upper Thames. They move through man by man. The Japanese front-loaded their race in an aim to unsettle the Germans who have come back. Who will crank it up int the enclosures. The Germans start to move through the Japanese. The Germans edge ahead at the public enclosures but the Japanese are not yet beaten. The Germans stretch ahead in the Stewards enclosure, the Japanese challenge to maintain overlap. That was a tough race and the Japanese should be proud of that race. Very well matched crews in these two quads and some good clean sculling. A very tight race. At the half way point they are side by side and if you are this close together at Upper Thames this is going to be a real hard race. Nip and tuck. Nottingham put on a surge and seize the race by the scruff of the neck at Remenham. They open up a lead of a couple of lengths and Birmingham are going to find it hard to respond to that. Grenoblois are warned straight off the start, straight into the buoys and straight back into the middle – the zig zag will blow the rhythm apart and the Dutch take the advantage that’s been handed to them and move to a length lead a the first maker post. Grenoblois continue to have steering issues and are not making a dent on the Dutch lead as they move past the barn bar and take the rate down. The French are fighting but are not in contact and are struggling to find their composure. The Dutch let the French come back in the closing 100m to ain overlap on the finish with the French a little close but it was definitely the Dutch crews race. Uglow from Imperial takes an early lead. Wells a length down already, as they move into the booms. Same margin past Fawley – this is Wells ninth Henley and it’s a hard race to be in the single. Wells is also in the Army eight, as doubling up at Henley is allowed. Uglow has rowed the channel in 2015 so he’ll be used to the boat wash at Henley. Uglow showing better technique to Wells, as Wells takes the rate up still challenging Uglow into the public enclosures. The Army officer is still fighting in front of the grand stands as Uglow pushes the finishes to build to the line and respond to Wells. Coxed fours and the first couple of 100m meters have proved significant. The Stratford crew were the right side of 1ft verdict last year and early on they have a one length lead at the 500m mark. This is going to be a race from the first stroke. Riverside come back in the middle of the race as they push back on the lead Stratford created in the early stages. This is a real too and fro race with each crew taking the lead and then losing it. It will be decided in the last 10 strokes who can take this line and it could be Stratford. Only just. Interesting steering from City of Bristol B crew and scrappy start again, after yesterday’s memorable race against Sydney. City of Bristol smash into the booms at the end of the island as they get close to the buoys, but don’t steer away. They are completely dropped by their opposition, and UTS continue to power up the course and settle into a relatively easy rate. This is now a procession with UTS paddling. The Bristol crew can’t be disheartened and must keep their heads on their race plan, despite that disaster. The umpire warns the Bristol boat as they come into the public enclosures. It’s been a tough morning out for the Bristol crew, who are meandering all over the course. Still racing for the line however as the UTS remain in control. Bristol are really struggling in front of the Stewards as UTS take the win. The big red bears of Cornell smash it out of the blocks stopping a UL final maybe? At the 500m mark Cornell have a length. Very fluid and calm rowing. They are not messing around and are laying down a marker. Interesting kit comnbinations in this crew despite their class – hooped red and white leggings remind the writer of Pippy Longstocking.. The UL crew are fighting all the way down the course but are not making a dent in the Cornell advantage. Still clear water at the public enclosures to Cornell. The UL crew are rowing hard to the finish line. UL dug deep but Cornell beat Univeristy of London. A little bit of an issue as they head out from the start Brookes move to the middle of the track which is usually an indicator of the fear of the booms and the stream that those who get the bucks station have. A length advantage at the 500m mark. Settling into a strong rhythm from Leander as Brookes are meandering a little. At the Barn Bar there is clear water between the boats and Leander, who train on this stretch of the river show their understanding of the course, as they get a bit close to the booms but don’t flinch. Brookes move to the middle of the course. Not a good place to be as you’ll be in the dirty water coming off of Leander. They’ve had a few steering issues which could be because of the pushes they’re putting in to stay in the race. Leander are making their mark on this race having lost to an American crew last year, so will be aiming to make a mark this year. Leander are into the enclosures with a comfortable lead outclassing the Brookes gritty but not technically as strong crew. Leander take the Stewards applause and stay consistent to the line as Brookes build. In the Leander quad Charles Waite-Roberts, who stroked the boat said: “ It was a good start to the campaign. We went out hard, controlled the race and were able to watch for any moves coming down Fawley. Leander’s Ling has a slight lead over Jenner from Agecroft from Manchester. A world class start rower in Jenner is learning to scull whereas Adam Ling is a former lightweight and has the technique to power away from Jenner in the first part of the course. Ling is really having to work on this course. Jenner could push through in the enclosures if Ling can’t take it up. Jenner has the weight advantage but not the history but he could race to the line. In a single this can be a lonely race but these two guys are still pushing each other all the way down the course. Ling drops the rate through the enclosures as Jenner hasn’t proved to be able to react to the build for the finish. The lightweight has taken the race over the heavyweight, by a length. As Jenner suffers a little on the finish line. Ling said after the race: "It was pretty cool. I knew I had to hold him for the first part as he’s bigger than me and I had to keep up my efficiency in the middle of the race." "I have no experience of racing here before so it took a bit of time to settle into a rhythm. But once I got into it I was away." Coxed fours between France and Scotland – Scottish National Champions. The Scottish crew are more dynamic than the French crew out of the blocks and the Scots move away at the 500m mark The French crew need to stay in contact to stop this being a procession. The Scots crew have a comfortable lead over the French at Upper Thames and the cox in the Scottish boat is calmly working them through their race plan. The tandem rig in the French crew is not proving beneficial in this race as they are not making a dent in the distance between the boats. The St Andrews take the rate down at the enclosures rowing comfortably, taking the applause. Coxless fours with London steering towards the island and buoys but correct and enter the booms straight. Northwitch are having to hang onto the London crew. Northwich lose touch as London move into control as they move in front of the Upper Thames enclosure. The London crew are leading with a little bit of a push towards the finish line. They are rowing comfortably as Northwich move into more of the centre of the track. The London crew have Ruby written on their arms – the name of their coaches new baby girl. Northwich are coached by Matt Langridge who is the only GB rower with bronze, silver and gold. Northwich still slightly off their station as London keep them at bay. Coming up ti the line Northwich let the rudder go in the last five strokes but the race was done at that stage. A bit of steering off the start and look to get the composite crew out of the middle of the river – some erratic steering as they then head directly towards the booms. A solid lead, however, has been generated and obviously the aim was to dominate the race early on. The flag has been used quite a lot in this race to keep the crews apart as the Queensland crew are also warned. The Tideway crew are still in command though they are keeping the rate up. At Remenham they have several lengths clear water and are easing through the stroke but they’re still putting the power down in the legs, despite sitting on the Australians. Stroke and three seat are having a conversation in the Tyrian boat. The Queensland crew are racing their race and are quite close to the booms in the enclosures but the Tyrian crew are settled and strong as they cross the finish line without taking the rate up. Both crews are warned to move apart -as they’ve drifted to the centre. They responded straight away. Yale have a slight advantage over the Australians as they come into the booms. The coxes are warned again. Yale get the flag. The cox acknowledges. The Australians are not able to respond having had a hard race yesterday which could have taken more out of them than they expected. Yale take the rate down as they past Remenham with smiles in the boat. The Australians take the rate up into the Public enclosures to 36 but they are not breaking the lead Yale have created, down. An easy win for the Yale crew as Australia take it up to the line. A lightweight German sculler in red and white versus the English Imperial sculler who came through qualifiers. The German drifts into the middle but at the end of the Island she moves back to her station without being warned. The German has a length lead at the 500m mark and squeezes away to break contact form the Imperial Sculler. A commanding position for the experienced lightweight international. Judith Anlauf establishes a strong lead to several lengths. Anlauf has competed at three world championships and is dealing well with the river conditions as the river traffic flows passed. Whittaker is trying to keep in touch but is rating under 30. Judith showing her class as she comes into enclosures and she takes the rate up. Taking it up a pip for the line Anlauf wins over Whittaker. Under 18 women’s quads and competitive racing with Headington having quite a pedigree – this A crew is a quick crew. Headington have a commanding lead at Upper Thames, Globe are still fighting and though they had to qualify they are showing their class by continuing to race their race plan. The race is being umpired by Sarah Winckless wearing her Cambridge blazer. We have a piece on her in the Henley Standard this week – make sure you get your copy. The Headington girls are sculling smooth and powerfully just keeping the distance at couple of lengths rating 28, whilst Glove are 34. The Globe crew are a little shorter and aren’t matching the power of Headington. Coxed fours Sydney versus a London crew. Quintin squeeze sideways off the start and the cox has to correct the pressure difference. UTS have a lead over Quintin at the 500m mark. Slightly better stroke profile in the Australian crew and UTS are in control of the races with several lengths clear water. They’ve taken the rate down and are floating over the water at 24. They have a weight advantage over the Quintin crew who are still fighting and still trying to race their race plan. UTS are powering into the enclosures though Quintin are still trying to push back the distance. Bristol seem to settle a little earlier but then take it back up into a power rhythm but Imperial keeping edging away. Bristol put in a push as Imperial try to push to a length up - still at 40 in the Bristol boat. The Imperial crew move smoothly away through the Barn Bar. Bristol are fighting down the course rating 36 but are not matching the core power of the Imperial crew who contain a boat race crew reserve. Bristol won by four lengths yesterday but the role has been reversed today where Imperial lead by 4 lengths into the enclosures. Imperial take the rate down and are in control of the distance, conserving their energy as they come to the finish line. Two coxed eights and a long hold from Brookes at the start. The Dutch crew have a slight lead over the first few strokes despite a really powerful Brookes start. Both crews moving out into their power rhythm though not dropping the rate, as they hit the main part of the track. At the 500m mark the Oxford Brookes crew are a canvas in front but the Dutch are not going to roll over and give the local crew any water. Both crews are bow side stroked. Brookes at 37, Njord at 36, with a slightly longer stroke. At the Barn Bar Brookes keep their nose in front with some big pushes from both crews. The Dutch take the rate up at the Fawley mark and keep the overlap but Brookes are trying to inch away at Upper Thames. Brookes settle but Njord are not letting off the power. Njord are still on the stroke man – will they move through the boat? Two thirds of the race gone and the Brookes crew put in a big push to try and shake Njord. Still overlap. Both crews take the rate up in the last 200m and in front of Stewards the noise of the crowd rises as they are fighting for the line. The Njord crew move to 37 Brookes at 38. Brookes take it up again and they push to the line first. A class act in Osborne with a lightweight against a heavy weight, the South African having been in two Olympic games. Very smooth sculling from both girls with McCann having a slight lead into the booms. LLightweights tend to have a fast start. But heavyweights can pull it put as they settle into their pace. Hanna Osborne moves into a dominant position at Upper Thames and into the Public Enclosures has a two/three length lead. The Lightweight is wearing a lot more kit than the heavyweight and is probably feeling the chill. McCann raises her rate and aims to stay in touch with Osborne. The New Zealander has a strong finish using her power to make it look easy and in control. Both girls displaying good technical sculling. Girls quads. A tight race between the Glasgow girls who had to qualify on Friday last week, and the Becket A crew. They are side by side as they come to Remeham. A truly competitive event. Very close, good steering and impossible to call as they are aiming to sprint the finish. Becket pull away with an early push to two thirds of a lead but the Glasgow girls react at the public enclosure this is a real tussle. Keeping the sculling smooth the Glasgow girls take it up again with a little steer to the right but they make the right correction and move again to a lead in the Stewards enclosure. 100m to go and they’ve opened it up with more control as Beckett are showing their tiredness in the stroke. Coxed Fours and Bayer are the holders of the title of this event. They’ve gone out strongly and are pulling away as they come into the booms being half a length up. Tthe Molesey crew hang in though and in the middle of the course they are staying in the race. All to play for as they past Fawley and Molesey are not letting the Germans go. Both crews rating 34 and a length lead. The Germans make a change to 36 but Molesey take a few feet as they react to the Remenham crowd. Molesey still in touch with the Germans. This is a very well matched pair of teams. The Molesey crew are not letting the Germans make a big finish. Molesey put in a move at the public enclosures and really move up to half a length. Rating 37. Molesey doggedly hung in and the pressure is on as they come to stewards. A nerve racking race particularly for the young German cox. Both of these crews are front loaded so the cox crosses the line first. This is a fantastic race this is to the wire this is within a few feet. Five strokes left and both crews fighting for that line. Too close to call. An incredible race as Molesey clawed back every inch. The coxes steered a straight race, with no input from the umpire and this is a photograph finish.. This will be down to the last stroke. A win for Bayer over Molesey by 1ft (30cm) A hard fought race with a seeded crew losing. Two eights on the course now. Straight into the race and a great start form UL on the Bucks station, opening up a length coming up the top of the Island. This crew raced a 6.20 time for the course yesterday so this is a quick crew. UL rate 28 at the halfway mark, though Southampton are still rating 34 trying to claw UL back. Ul have a comfortable open water lead. Molly Brown who is coxing the Southampton crew has rowed across the Atlantic with Guin Batten, who is Umpiring this week. The crews are attached early and are awaiting the umpire. Coxless fours - let’s see how straight they go off the start? Little stream but a very long hold. Both crews away cleanly and steering well. The German crew have an almost perfect line into the booms. Mercantile squeeze into a lead as they enter the straight past the 500m mark. Both crews rating quite high still. The Germans put in a push to stay in touch with the Australians who are making a big move at Remenham Church. Mercantile drawing ahead with a couple of lengths lead at the Barrier. Mercantile steering into the middle of the course and at the Barn Bar enclosures they’ve wandered. Boris Rankov is umpiring today so this crew has to move back or they will be warned. The Australians rating 34 are consistently pulling away and are in control of this race at the half way mark. After yesterday’s hard race against Molesey this is an easy race. The Australians are bow side stroked whilst the Germans are stroke side stroked. The Germans are hanging in but are not making headway into the distance that’s opened up.